“A New Way for Mothers” – Mumpreneur, Louise Webster’s new book offers a revolutionary approach to family life. I first met Louise five years ago when she launched her award-winning website www.beyondtheschoolrun.com and was immediately struck by her energy, passion and our shared commitment to unlocking the wealth of talent amongst mothers who have put aside their career aspirations to prioritise their children. 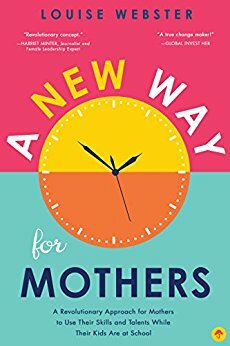 I was therefore delighted to be asked to contribute to Louise’s first book “A New Way for Mothers” - an inspirational read that offers support, encouragement and a step-by-step approach for every mother wishing to engage her talents during the hours her children are at school. In ‘A New Way for Mothers’, Louise shares her experiences, learnings and the wisdom of many others including myself, to help mothers find purpose and balance as their children go through school. As journalist Harriet Minter, remarks, “Rather than seeing motherhood as a separate stage in a woman's life, Louise's approach brings in all of our life before it and asks, who are we as a whole person?” Packed with practical advice, strategies and tips, this revolutionary book will help you become fully engaged in all aspects of your life, from the school gates to the working world. Louise Webster, founder of Beyondtheschoolrun, talks to Inspired Mums about her passion for creating a place to inspire, engage and connect people with the working world in the hours available to them. I was head of PR for Fox Kids TV. I then decided I wanted to set up my own PR company Rare communications with the idea that I would have flexible working arrangements once I had children. It became very successful but after I had my first child I realised I hadn’t actually created any flexibility at all and found keeping it all going quite stifling with a young child. Why did you decide to change career direction? I decided to merge the company and I became a full time mum for about 2 to 3 years. About six months after I had my second child, I felt I really needed to use my brain. I decided to take some steps to get back to work and what really dawned on me was how many barriers there were – from finding childcare to being told I was too senior for positions. I felt I was being devalued because I was mum and had taken some time out. What motivated you to set up Beyondtheschoolrun? My son had started school and I became aware of the pool of talent of the mums at the school gate. I felt we needed to find our collective strength again – build on the levels of empathy and confidence that comes from having children. Instead of dumbing ourselves down – I wanted to create a place where people could come together to inspire and empower each other. Tell me more about Beyondtheschoolrun and what you hope to achieve with it? I launched BTSR in order to provide a place for parents to go to at any stage of their journey to find inspiration, opportunities, wisdom and connections. Whether it’s a young woman who’s concerned about having children because of what it will do to her career or a mother whose children are off to university and who hasn’t worked for 15 years and doesn’t know where to begin. Within a couple of months of launching the website, we had 20,000 page views. A few months later I received an email from 10 Downing Street asking me to come and meet David Cameron’s special advisor on women and family issues, Laura Trott. Seeing people start to flourish and discover themselves and working together in a non-competitive environment. I’m also passionate about growing a business for social good, and in particular showing how a woman can do it. I think the most challenging thing is there’s no one really doing what I’m doing. So it’s finding the support. I’m convinced it’s there but I just don’t know how to tap into it. At times it can feel as though you are swimming against the tide – other times you receive emails and calls and feel hugely supported. Have you found a good work life balance? No – I’m still on the journey – at times I do – other times I don’t. For me it’s not just about finding my own balance – I also think we need a great change in the way everyone works to ensure greater happiness. Personally, I believe it’s mothers that will change it by finding what works for them – we are, after all, our children’s first inspiration and role model. My aim is to work with organisations to help create jobs so that we can keep the flexible work movement going forward. I would also like to work with the education system to ensure parents’ voices are heard. What advice would you give to other mums standing at the school gate? Follow your heart and take that first step and just see how it feels. For one person it may be volunteering, for another taking up a job to earn some pin money, for another it may be finding a support network – everyone is different but together we can do it.